This awesome interview comes to us courtesy of Bonnie from A Backwards Story. We've already mentioned Bonnie and the sphere of awesome she inhabits -- she's really gotten on board with Fairy Tale Fortnight, and on top of posting scads of awesome reviews on her blog during the event, she's also sending some pretty terrific content our way, to share with you. 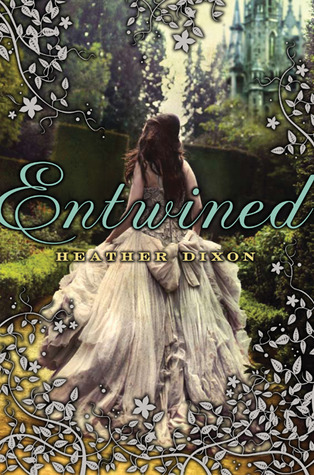 For today's post, Bonnie sat down to talk with Heather Dixon, author of the debut fairy tale Entwined, based on Misty's childhood favorite, The 12 Dancing Princesses. Heather was kind enough to not only sit down and take the time to answer some questions, but scrounge up some awesome Disney trivia for everyone! Thanks so much, Heather! 1) What were your favorite fairy tales growing up? What drew you to them? I really loved Disney’s Cinderella, and, of course, The Twelve Dancing Princesses, for the same reason: the visual aspect! I loved watching Cinderella’s rags transform into a beautiful dress, and I loved going through The Twelve Dancing Princesses picture books and seeing all of their dresses, and the sparkling forests. Call me shallow…I like pictures. 2) Was it hard coming up with your own spin on The Twelve Dancing Princesses when you began world-building for Entwined? How did you bring everything together? The early-early drafts of Entwined were horrendous. It was much closer to the original Grimm fairy tale, took place in the medieval time period, and there was a lot to do with witches and blood magic. But it was so dark; I didn’t enjoy how I felt when I worked on it. It wasn’t until I established the theme of the story—forgiveness between the princesses and their father—that it started to take off. The Victorian time period, with its rules and mourning, was the perfect backdrop. Not to mention the dancing with waltzes and balls, and the courtships! Like magic, everything unfolded after that. 3) What are some of your favorite fairy tale inspired novels and/or authors? I like all of them, from Ella Enchanted to Beauty! My favorite though is Keturah and Lord Death by Martine Leavitt. It is a beautiful story with so much depth. 4) If you could live out any fairy tale, what would it be and why? Yikes, I don’t know if I’d want to live one out. They’re all kind of Grimm. (Ber-dum ching!) I wouldn’t say no to Sleeping Beauty. She has a pretty cushy life and gets to sleep for 100 years. I could handle that. 5) Will you be writing any more fairy tale novels? Can you tell us anything about your upcoming work? Right now I don’t have any fairy tales in the novel pipeline, but I can see myself doing a princess comic or picture book, or a long rhyming fairy tale. (A fun one: a retelling of Undine, but with the princess trapped in reflections rather than water.) I’d also love to do a novel of The Nutcracker or Candyland. 6) What’s your favorite Disney rendition of a fairy tale? What makes it so special? I love all the Disney fairy tales. They do a tremendous job with their adaptations. I feel a real kinship with Disney’s Sleeping Beauty though because of the spectacular art. The beautiful Eyvind Earle backgrounds/art direction and the Tom Oreb character designs are so inspiring. I find it very touching. -The backgrounds in Disney's Snow White are muted and soft because the artists were unsure people could handle brighter colors in a feature-length film. -Disney's new movie, Tangled, was originally meant to have a rococo look, but when the project switched direction, the makers chose Disney's Cinderella and Disneyland's Fantasyland (!) as inspiration for their new look. -Some little-known fairy-tale adaptations Disney has done: The Tin Soldier (from Fantasia 2000) and The Little Matchgirl (a short at the beginning of The Little Mermaid’s re-release). They've also been working (off and on) with Hans Christian Anderson's The Snow Queen. -The tall, vertical trees and square bushes in Disney's Sleeping Beauty were based off of medieval tapestries. -Right now Pixar is working on Brave, a fairy-tale story about a girl archer. -Disney's Cinderella takes place in the late Victorian era. Thanks so much to Bonnie and Heather for that awesome post! Make sure to check out all of Bonnie's great reviews during Fairy Tale Fortnight, and definitely make sure to pick up a copy of Entwined, in stores now! This is such a fun interview. Loved all the Disney facts at the end. I love Disney adaptions so much. Entwined was a great read! I didn't adore this book, but Dixon really created a magical setting and feel to it all. Plus, I may have to get a finished copy because they are gorgeous. Thanks for the awesome interview! This was a great interview! I can't wait to read Entwined! I've only just started ENTWINED but already I'm in love! Er, I mean, impressed. ;) By the amazing writing and storytelling and worldbuilding. You can tell Heather took a lot of time and put in a lot of care to make this story come out right. So I love getting more insight to her as a person and an author. Thanks for the great interview, ladies! Loved this book. Does Heather have an author website I can check out?